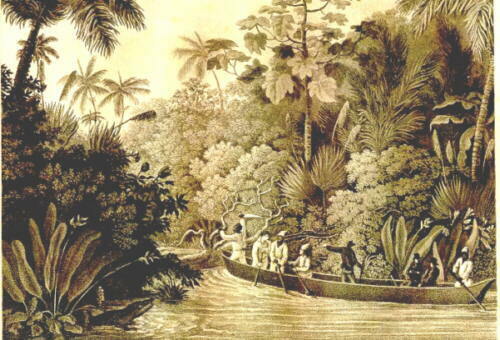 Several years before Prinz Maximilan zu Wied-Neuwied made his famous scientific expedition to North America, he conducted a similiar expedition to South America, specifically, to the tropical forests of Brazil. 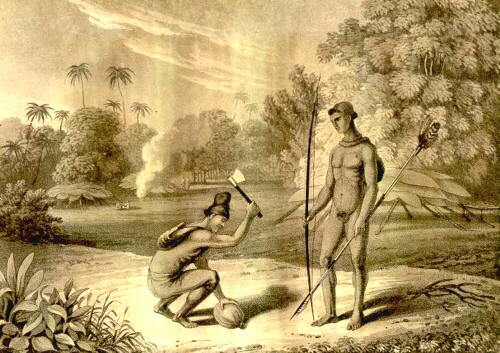 The book contains six plates showing magnificent Brazilian scenes, two of which include the Prince himself. 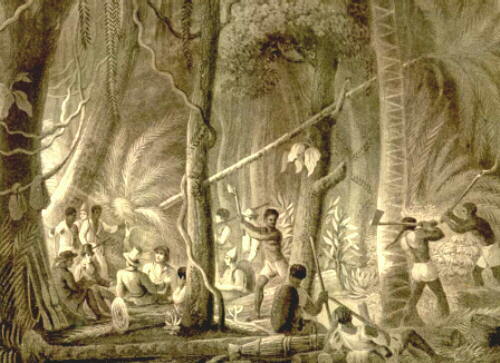 "When our first curiousity was satisfied," writes the Prince (p. 118), "we requested the savages to conduct us to their huts... They are certainly some of the most simple in the world...small and so exposed on every side, that when the weather is unfavourable the brown inmates are seen seeking protection against it by crowding close round the fire...: at other times the man lies stretched at his ease in his hammock, while the woman attends the fire, and broils meat, which is stuck on a pointed stick." 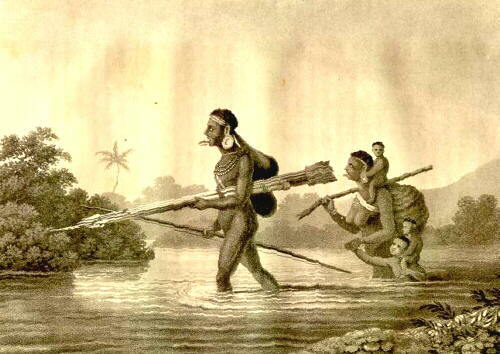 Prince Maximilian writes on page 247: "They were of the tribe of the Patachos, none of whom I had ever yet seen, and had come down from the woods to the plantations but a few days before. They entered the town stark naked, with the arms in their hands, and were immediately surrounded by a crowd of people. They brought large balls of black wax for sale, and we procured a number of bows and arrows of them, in exchange for knives and red handkerchiefs." The lamentations and howlings of the women and children likewise resounded from the neighbouring huts, and heightened the effect of this most singular scene... In this manner the combat continued for about an hour; when all appeared weary, some of the savages showed their courage and perseverance, by walking among the others, uttering their tones of defiance... All of us then left the field of battle, which was covered with earplugs and broken poles..."